I have to admit setting aside 30 minutes of sewing time every day for ourselves seems so hard. I did have some starting trouble but once I setup by machine for free motion quilting I was able to spend anywhere from 30mins to an hour each day. 2. FMQ different designs for each color and pretty dense actually. This is what I have got done so far after a total of 4 to 5 hours of quilting. So, you can imagine why I call this quilt a beast. Plans for next week, I am hoping that I can get the smaller of the two pink blocks below done. Looks like it would be great even if I can just get the pink areas done by end of the month. That seems like a more realistic plan. 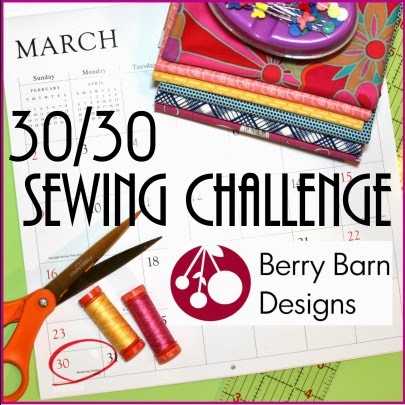 Now linking up to week 2 of 30/30 Sewing Challenge @ Berry Barn Designs. Wow! That is a LOT of quilting but it's looking fabulous! I don't get email about your comments once you moved to wordpress.com. Malini, that looks amazing so far! I have so much respect for those of you who can FMQ such beautiful and large pieces with your domestics. I love this quilt design and the quilting your using really makes it pop! That's beautiful. SO much work but it will be worth it. That is some intense quilting... Especially on a small machine. Good for you keeping at it, Malini! It looks great! I love the design of that quilt and the colours you chose!